Karen Robertson is the author of two award-winning book apps in her “Treasure Kai” series. 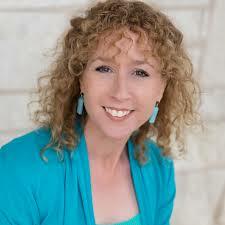 She’s also an international speaker and is the author of five eBooks about creating and marketing book apps. Buzz Words talks to Karen about her book app journey and how she has come to develop Book App Academy, a program to help others develop their own apps. Hi Karen and welcome to Buzz Words. Can you tell us a little about your own book app journey? No one is more surprised than I am that I’ve published my books as book apps because I’m about as technophobic as you can get! But two things happened in June 2010 that changed my career. 1. I was about to re-print my interactive treasure hunt adventure book with toys, “Treasure Kai and the Lost Gold of Shark Island,” and publish the second book in the Treasure Kai series. I was frustrated because even though the book had proven international appeal, I felt limited to the Australian market due to the cost of distributing the book internationally. 2. My dyslexic son picked up an iPad for the first time and chose storybook apps over game apps. “Treasure Kai” books are all about interactivity, so I could see the opportunity to take interactive reading to a whole new level and deliver a multi-sensory reading experience if I published the books as book apps. I worked with a friend of mine to source a developer, plan the book app and produce it. We published “Treasure Kai and the Lost Gold of Shark Island” in 2011 and “Treasure Kai and the Seven Cities of Gold” in 2012. Both are award winning book apps and the best thing about them is our ability to reach a global audience. We’ve sold “Treasure Kai” book apps in nearly 100 countries and we’ve sold apps every day for over two years. What is a book app? How does it differ from an ebook? I’ll describe the user experience here rather than the technical differences. eBooks and book apps are forms of digital publishing. eBooks tend to be simpler versions of digital books and can be as simple as a book with illustrations and text, or can have some basic functionality like narration or light sound effects and animation. They are designed for e-readers (like the Kindle, Nook, etc.). There are also enhanced eBooks which are eBooks that include multimedia content like audio or video. Book apps are eBooks on steroids. They have more functionality like interactivity that brings the reader into the narrative, more animation, sound effects, music, text highlighting and even games or video. Who can create an app? Anyone who owns their digital rights can publish their book as a book app. This includes unpublished work, self-published work and published work where the author owns the rights. Can any book be made into a book app? Not every book is suited to be an app. Some are more suited to be eBooks. The best candidates for apps are illustrated children’s books or books with images and bonus content like video, audio. Novels and middle grade are better suited to be eBooks. 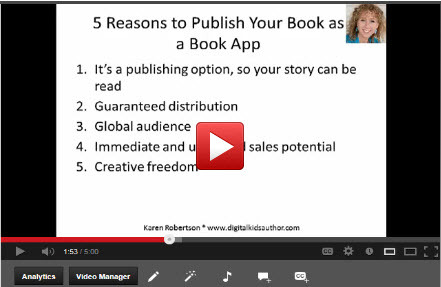 Why should authors consider creating a book app? Do authors considering creating an app have to be techie geniuses? No, and I’m living proof! The key to getting passed the intimidation of technology is to learn about the process - not the coding process (yuck!) - but the planning and creation process. It’s actually a lot of fun to think about your story in a multi-sensory way. Creating a book app is a step-by-step process and if you follow the process, it’s a very achievable goal. Even finding a developer (the part many writers find the most intimidating) is a step-by-step process. I’ve written a blog post about the issue of not needing to be a techie here (www.digitalkidsauthor.com/bookappcurious). Why did you develop Book App Academy? I started writing, speaking and coaching about book app creation and marketing quite by accident. Just three short weeks after publishing my first book app in February 2011, the iPad 2 was released. We found that our app would occasionally break on the iPad 2 (a bug) so asked our developer to fix it. That’s when I learned about a big mistake we’d made. Our developer had moved on to another job, and we hadn’t negotiated his responsibilities for fixing any problems. So when he couldn’t fix it quickly, he dropped the job! We were out of market for 10 weeks. To save my sanity, I wrote “Author’s Guide to Book Apps,” an eBook about how we created “Treasure Kai and the Lost Gold of Shark Island,” the things we did right, and the things we did wrong. Six months after I published “Author’s Guide,” I started getting emails from writers who had used my guide to create their own books apps. It was so exciting to find out that my information had helped other people make their publishing dreams come true. That ignited the fire under me to keep sharing, writing, speaking and coaching. Because I’ve created three book apps myself, done some things really right and messed some things up royally, worked with dozens of other writers, interviewed dozens of suppliers and paid attention to what works and what doesn’t, I’m in a unique position to save people a lot of time and money by sharing what I’ve learned. What I found during coaching sessions was that the same questions kept coming up over and over again. I decided to create Book App Academy, an online, home-study course using over 40 video tutorials, to step people through the process of planning and creating their apps. I first launched it in June 2012, insanely in the middle of my move from Sydney, Australia to Austin, TX (another story), and it met with rave reviews from the inaugural students. I’ve now updated the course and added a number of tutorials, Q and A calls and a private Facebook group, and will be launching it in June 2013. Where can interested authors learn more about book apps and Book App Academy? Visit www.digitalkidsauthor.com/bookappcurious and read answers to the three most frequently answered questions about creating book apps. Then, if you want to make sure you hear about Book App Academy, you can opt in by entering your name and email address. I’m creating a free webinar about book apps that I’ll be sharing in early June so if you’re even a little bit curious about book apps, be sure to opt in!